The purpose of Movement, Meditation, MindPower is to perform movement that entices full-body consciousness through dance and improvisation. 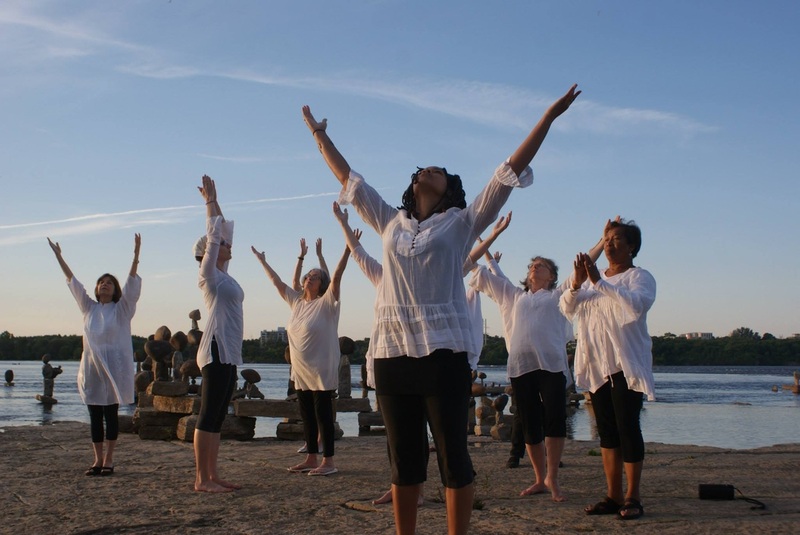 Pulling from yoga, Alexander technique, meditation, and movement ritual developed by Anna Halprin, the process culminates in dance that is holistic and centering. MMM classes begin with a warm-up that facilitates awareness of our present self and environment. Constructive rest, awareness of breath, and activation of the pre-fontal cortex through mindful exercises are practiced. With closed eyes and sequences from Anna Halprin’s Movement Ritual we engage the core and limbs to lift, fold, arch and breath through gentle patterns. The warm-up invigorates and aligns the body, cultivating warmth and energy, and includes principles from Yoga. The exploration segment utilizes various dance concepts and improvisation including partnering. There is something special about moving in sync with another person. After a while the subconscious takes over and you find yourself within the moment. When the mind, body, and soul are connected, higher vibrations grow. Following we engage in dance phrasing and drawings of self-portraits. The portraits are reflections of ourselves at the very moment, and reveal much of the subconscious. Over periods of time, the self-portraits become more detailed and elaborate, displaying the dancers growth in self-awareness. To develop a deeper kinesthetic sense, MMM explores sensory awareness in nature. Some activities include sensory walks through nature, and partnering and mirroring exercises. Experience in the outside environment is also beneficial for the choreographic process. The Planetary Dance is a community drum/circle dance of peace. It is perfect for all ages and can be performed at retreats, community centers, festivals, churches, schools, and more. Planetary Dance (Circle the Earth Ritual) stems from a folkloric-like tale that is true and legendary, manifested on top of Mt. Tamalpais in the San Francisco Bay Area. From 1979-1981, six women were murdered on top of this mountain, leaving Marin County enraged and helpless. Along with her husband and workshop participants, post-modern, dancer, choreographer, and healer, Anna Halprin decided to enact a positive dance ritual: In and On the Mountain. Scaling the mountain, the ritual lasted for several days and a few days later, police caught the serial killer. Following the newly found Planetary Dance, Don Jose Mitsuwa, a 109 year-old Huichol shaman visited Anna and told her, “This mountain is one of the most sacred places on Earth. I believe in what your people did but to be successful in purifying this mountain, you must return to it & dance for five years” (Circle the Earth). Thirty plus years later, Anna continues to lead the Planetary Dance in workshops and communities around the world. Recently, she began training community activists in leading their own dances. I am blessed to be one of the first certified Planetary Dance facilitators. “The Planetary Dance is a participatory dance rather than a theatrical performance. At its heart is the Earth Run, a simple dance that everybody can do. Participants are invited to run, walk, or simply stand in a series of concentric circles, creating a moving mandala. As we all move to the steady heartbeat of the drums, we become one collective body. Each step upon the Earth becomes a prayer for healing. Click for Planetary Dance website and blog post.